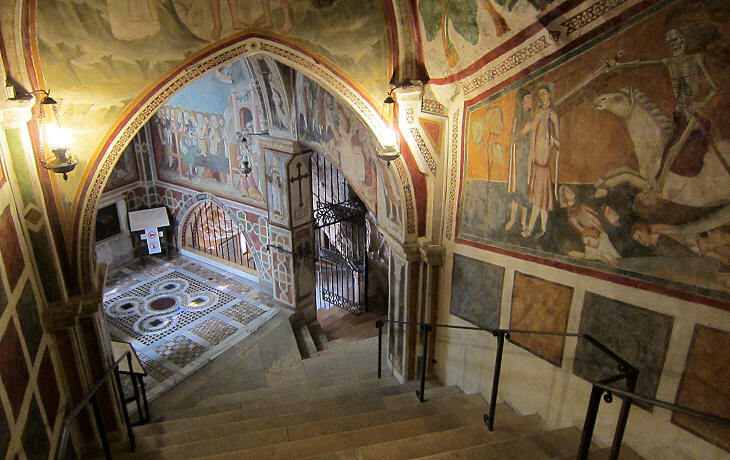 In July 1857 Ferdinand Gregorovius, a German historian best known for his studies on medieval Rome, visited Subiaco to look at some documents in the library of the Benedictine monastery of S. Scolastica. In the following year a German paper published Subiaco das älteste Benediktinerkloster des Abendlandes, a short account describing this monastery and that of S. Benedetto (Sacro Speco), which is located nearby (you can read the English translation by Dorothea Roberts in Bill Thayer's Web Site). Gregorovius provided his readers with a detailed historical background of the two monasteries. 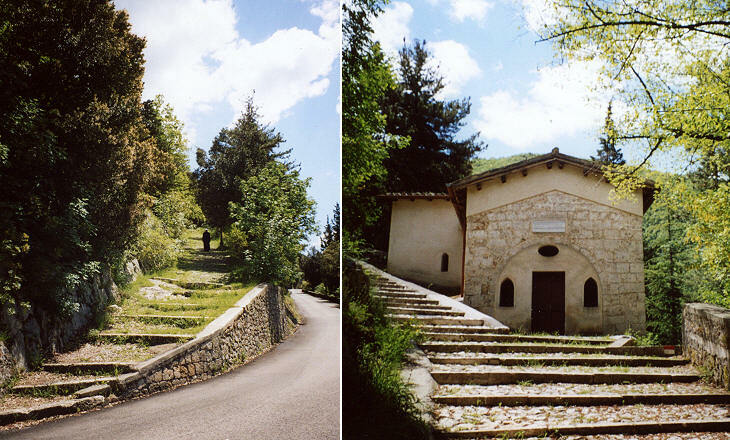 A modern road leads very close to Sacro Speco, but those who are not in a hurry may prefer to reach it by a 1688 picturesque track flanked by chapels which provide a perfect introduction to the visit. Towards the end of the Vth century, at the time of the Ostrogothic Kingdom, Benedict, a young man from Norcia (Nursia), a town near Spoleto, abandoned his studies in Rome and retired to live as a hermit in a cave near the former villa built by Emperor Nero in the Aniene River valley. He lived in the cave for three years; local shepherds placed some food inside a basket which they left in a small cave below that where he lived. The reputation of the holy life of the young hermit spread in the valley and after three years he was begged to become the abbot of a local monastery. In his years of solitude Benedict developed some strong thoughts on how a true Christian should behave. As an abbot he elaborated on them to develop rules for the life of his monks (Rule of St. Benedict). He is regarded as the founder of monasticism in Western Europe; he was canonized formally in 1220; in 1964 he was named the patron saint of Europe by Pope Paul VI. 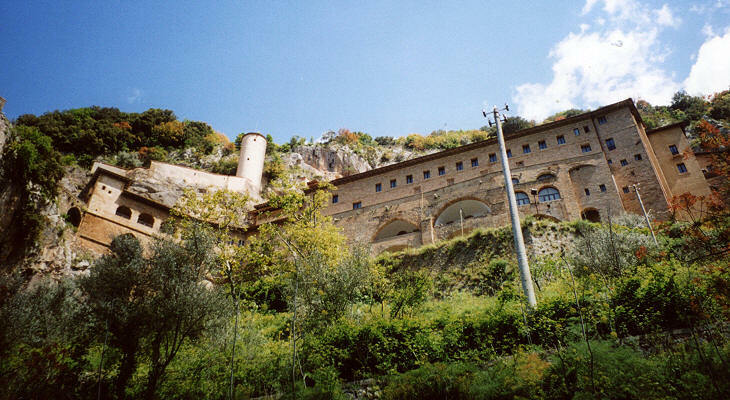 Towards the end of the XIIth century the abbots of S. Scolastica decided to build a detached section of their monastery around the holy cave (Sacro Speco) where Benedict lived as a hermit. The new monastery was built at various stages along a steep ravine; it seems to hang on the rock and it was compared to a swallow's nest by Pope Pius II (you may wish to see the monastery of Sumela, near Trebizond in Turkey which is in a similar position). The rocks above the monastery are almost threatening it; a modern statue in the upper courtyard portrays St. Benedict in the act of telling the rock not to fall on the monks who still live in the monastery (it is the image used as a background for this page). The entrance to the monastery is located at its upper end and the first rooms one sees are the last which were built and decorated. A small rose garden is an excellent starting point for visiting the monastery following a chronological order. According to tradition instead of roses it had thorn bushes and Benedict threw himself on them as a form of punishment for having had some unchaste thoughts. St. Francis of Assisi, who visited the monastery in 1223, turned the thorns into roses. A small very old fresco in the Shepherds' Cave indicates that the area was the object of worship before the construction of the monastery. One of the chapels which make up the Lower Church was dedicated to St. Gregory the Great, who wrote about the life of St. Benedict. The chapel contains the only contemporary portrait of St. Francis of Assisi: he is without the halo and he holds a paper with the words "Peace to this house" (Luke 10:5). A raven is mentioned in the life of St. Paul the First Hermit; the bird brought the saint a loaf of bread every day for seventy years (see ravens at S. Paolo Primo Eremita in Rome). Ravens saved the life of St. Benedict by stealing some poisoned bread he was about to eat. Ravens brought food to St. Chelidonia, a Benedictine hermit of the XIIth century who lived for more than fifty years in another cave of the Aniene River valley. Scala Santa (Holy Stairs) is the name given to the staircase of Pontius Pilate's house near S. Giovanni in Laterano. 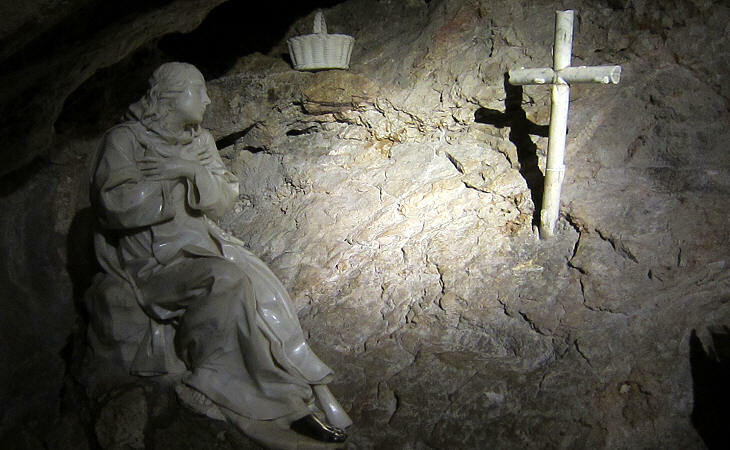 At Sacro Speco it applies to the stairs built on the steep path linking the Shepherd's Cave with the cave where St. Benedict lived. Notwithstanding the different origin of the stairs it is not unusual to see believers ascending it on their knees. 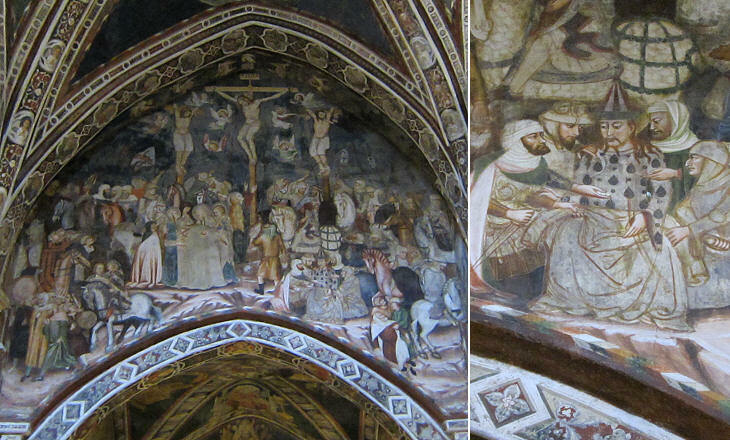 This part of the Lower Church is a mixture of different styles; the architecture is Gothic, while the Cosmati floor is typically Roman and the frescoes are of the school of Siena. The portrait of Pope Innocent III may not immediately attract the attention of a foreign visitor, but it surely attracts that of Italians as they saw this portrait in their history books at school (a Briton would have the same reaction when seeing the portrait of King Henry VIII by Holbein). 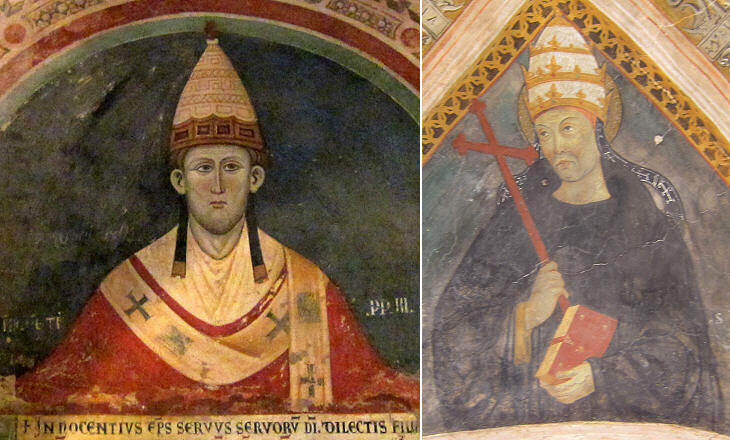 The painting is interesting also because it shows the papal crown as it was in the XIIIth century. In 1202 Pope Innocent III granted special benefits to the small group of monks who established themselves at Sacro Speco. Pope Leo IV favoured the return of the Benedictine community at S. Scolastica after the monastery and the whole Aniene River valley were raided by the Saracens in the IXth century. The pope is portrayed with the triregno, although this type of crown was not introduced until the end of the XIIIth century by Pope Boniface VIII. The Upper Church is composed of just one nave, but it has the appearance of a church. Of the many frescoes which decorate it, the Crucifixion is particularly impressive: it is worthy to note that those having a negative role in the portrayed event are dressed in Arab or Turkish costumes of the XIVth century. 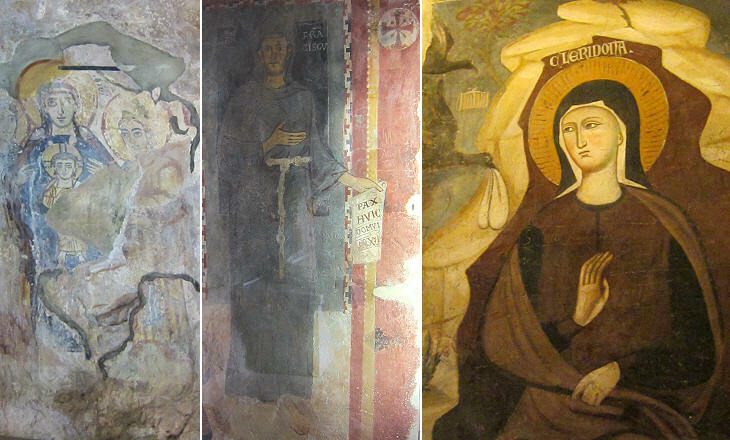 Almost every inch of the two churches is covered with paintings. 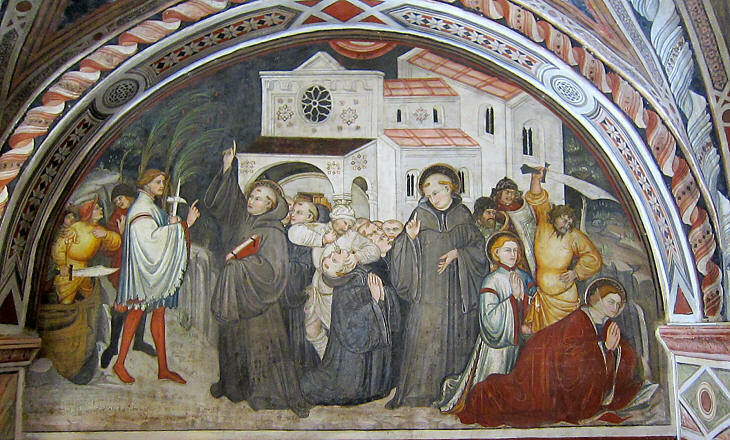 St. Benedict lived at a time when Christians were no longer persecuted, yet the fresco shown above portrays the martyrdom of Placidus, a monk who followed Benedict when the latter founded a new community at Monte Cassino. He was confused with another Placidus, a Sicilian martyr of the IIIrd century. 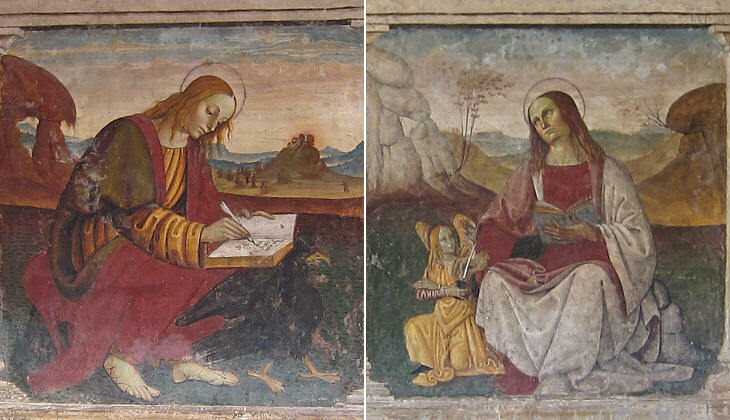 Sacro Speco continued to be decorated with new paintings until the beginning of the XVIth century; after that period, with the exception of Raggi's statue no other major additions to its works of art were made. 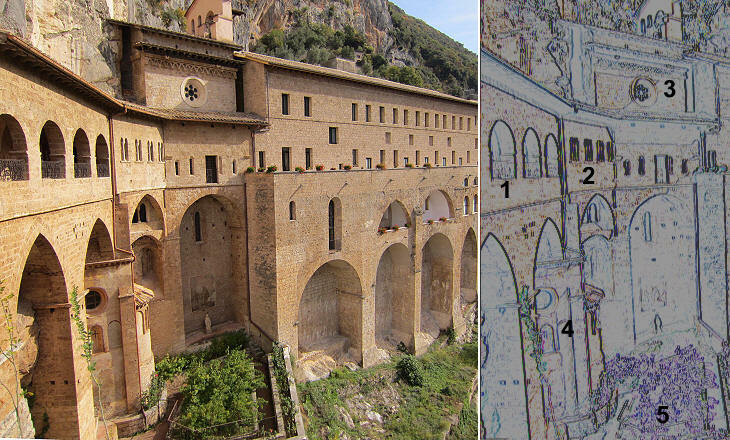 Return to S. Scolastica or to Subiaco.